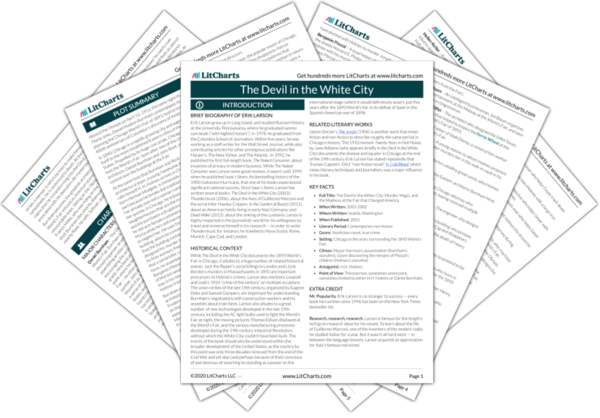 Instant downloads of all 946 LitChart PDFs (including The Devil in the White City). 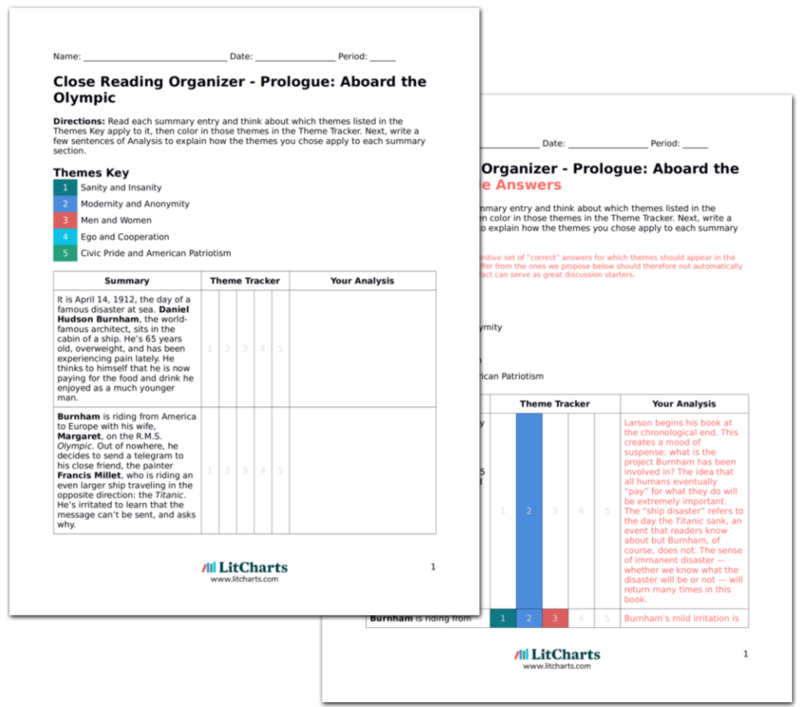 LitCharts assigns a color and icon to each theme in The Devil in the White City, which you can use to track the themes throughout the work. Geyer continues to search for Howard, sure that Holmes killed him in Indianapolis. Meanwhile, the police search Holmes’s building in Englewood, and begin to suspect that he killed dozens of women during the World’s Fair. One estimate puts the Holmes death count as high as two hundred. Even after finding enough evidence to sentence Holmes to death, Geyer continues to investigate. He’s committed to exposing all of Holmes’s crimes, and satisfying Mrs. Pitezal’s desire to find her son. In Holmes’s hotel, the police find airtight rooms and gas nozzles that seemingly serve no purpose. They uncover a bankbook recording 23,000 dollars, belonging to Lucy Burbank, who can’t be located. In the basement, they discover surgical tools, vats of acid, a skull, ribs, and various other human bones. This leads them to Charles Chappell, who is cooperative, and shows the police three skeletons from Holmes that he helped clean. The police also find the footprint, which may have belonged to Emeline Cigrand, on the inside of the walk-in vault. As soon as the police know what to look for, it becomes extremely easy to find evidence that Holmes is a murderer. This is especially clear in the case of Charles Chappell — he goes along with the police without question. Holmes was able to avoid punishment in Chicago because no one knew what to look for — they couldn’t imagine that he killed people and dismembered the bodies. Once they do know what to look for, it becomes much more obvious. It was the lack of imagination that someone could do what Holmes was doing that protected him most. Geyer travels to Chicago to determine if one of the skeletons in Holmes’s basement might have belonged to Howard Pitezal. In Chicago, Geyer finds the city terrified by the news of Holmes’s murders. At the beginning of the book, Chicagoans couldn’t imagine that a serial killer could come t the United States. By this point, that supposition has been proven incorrect. Geyer learns that the skeleton in Holmes’s basement belonged to a girl named Pearl Conner, a name that Geyer doesn’t recognize. Geyer is disappointed that he hasn’t succeeded in finding Howard. On August 19, what remains of Holmes’s hotel burns to the ground. No one is arrested for the crime, but it’s theorized that the fire was started by someone who wanted to keep the evidence in the building concealed. Even as he looks for more evidence of Howard’s body, Geyer finds evidence of other murders, underscoring how difficult it would be to keep track of everything Holmes did. There are still enormous holes surrounding Holmes’s crimes, a fact that both Geyer and Larson acknowledge. The mystery of who burned the hotel reinforces how little we know about this bizarre case. 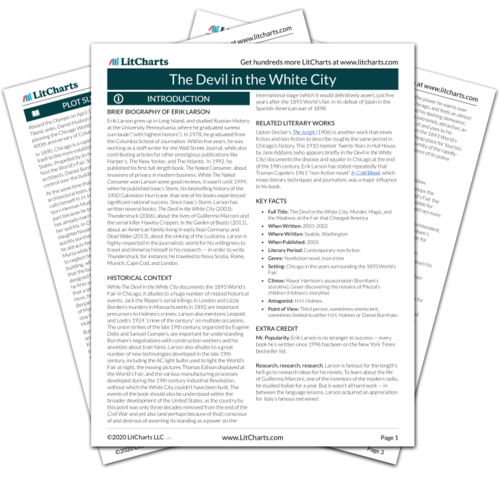 Get the entire Devil in the White City LitChart as a printable PDF. Geyer investigates hundreds of leads in Howard’s death. One day, he meets with a man named Mr. Brown, who remembers giving Holmes the keys to a house he was renting. Brown leads Geyer to a man named Elvet Moorman, who helped Holmes install a woodstove in his house. Geyer also talks to the owner of a repair shop who remembers Holmes coming into his shop and asking to have sets of surgical tools repaired. Geyer finds a human jawbone and teeth in the house Holmes rented. Mrs. Pitezal identifies Howard’s overcoat, and a toy that Benjamin Pitezal had bought for Howard at the World’s Fair. Geyer’s job is very difficult — he has to talk to lots and lots of people, until he finds the one person who has information about Holmes. Holmes thrives on the size and the anonymity of modern American life — whenever he chooses to commit a crime, the precise circumstances of the crime are difficult to pin down because there are so many other factors for people like Geyer to sort through. Arn, Jackson. "The Devil in the White City Part 4, Chapter 5: All the Weary Days." LitCharts. LitCharts LLC, 1 Jul 2015. Web. 23 Apr 2019. Arn, Jackson. "The Devil in the White City Part 4, Chapter 5: All the Weary Days." LitCharts LLC, July 1, 2015. Retrieved April 23, 2019. https://www.litcharts.com/lit/the-devil-in-the-white-city/part-4-chapter-5-all-the-weary-days.